This is the story of the Hanover community and its passion for baseball, the national pastime. The book traces the game's roots in Hanover after the Civil War ended. 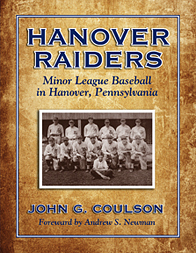 It touches upon the early years of local clubs and Hanover's first experience with semi-professional baseball, the Hanover Tigers of the 1896 Cumberland Valley League. It is also the history of the Raiders, the pride of Hanover. Originally named the Hornets, the Hanover Raiders participated in the Class D Blue Ridge League from its inception in 1915 to its premature ending in 1930 because of the stock market crash and the Great Depression. The story is much more than just baseball scores. It is a reflection on baseball's importance to the town's well-being. Raider players were treated like matinee idols within the community. There were colorful characters, major league stars, and hall of fame greats who walked upon the diamond on High Street. There were opening day parades, games that ended in near riots, victory celebrations on the Hanover Square, and players who died under tragic circumstances. a copy of the book, please click here.